Spring is the perfect time of year to start refreshing your beauty routine! Dewy finishes, light shades, and sheer hues are all a hit this season, but buckling down for a complete overhaul can be a (literal) mess without a game plan! 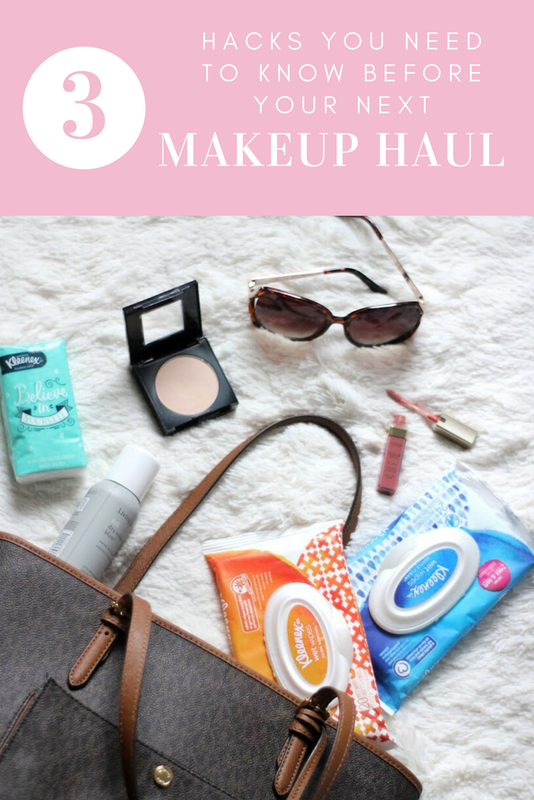 That's why I've teamed up with Kleenex Wet Wipes to share these Three Tips You Need Before You Upgrade Your Beauty Routine! Whether you're on the hunt for a new foundation or just browsing for the best pink polish, make sure you go in with a blank slate so your swatches are as accurate as possible! Testing can get messy, but it's worth it to get the right shade for YOU! Swatch liquid foundation along your jawline to match both your face and neck, powders like shadows and blushes across your inner forearm, and lipstick shades on the tips of your fingers (it most closely resembles your actual lips)! Speaking of swatches, there's nothing worse than planning out a shopping spree and having to spend the rest of the trip with an arm full of smudges. I finally found the perfect solution: Kleenex Wet Wipes at Walgreens! They make the perfect pocket-sized clean up for every on-the-go mess and I never go shopping without them. Kleenex Wet Wipes Gentle Clean make it easy to wipe away swatches without the harsh chemicals that other brands contain and Kleenex Wet Wipes Germ Removal are the ultimate choice for these flu season shopping sprees. Each wipe is safe and soft enough to use on your hands and face, while sturdy enough to tackle any little mess. Even if you're not into swatching makeup on the go, Kleenex Wet Wipes are the perfect tag-along for mopping up those accidental coffee spills, wiping off germ-y fingers, or just clearing up the evidence of that mid-afternoon snack ;) The travel size packages of Kleenex Wet Wipes are a must for me on the go--the options are endless! Stock up for your car and your purse with Ibotta's $1 rebate when you purchase 2 Kleenex Wet Wipes products! Got a tried and true product you know and love? Keep a checklist on your phone or in your purse with the brand, collection, and shade number of each of your favorites so you never come home with the wrong item! This also helps me compare between brands when looking for a new foundation, or when I need to adjust shades. My beauty routine is in for a total face lift this spring thanks to these helpful hacks and Kleenex Wet Wipes available at Walgreens! I can't wait to freshen up my whole regimen for spring! Are you planning a beauty overhaul? What other ways would you use hand and face wipes on your day to day? I like the tip about putting lipstick on the tips of fingers. I've always done the back of my hand. Oops. It’s definitely worth the extra effort! I live for wet wipes (and I don't even have kiddos around)! Such a great idea to take them make up shopping. I HATE being covered with colors! Me too! The bigger makeup stores have alcohol cleaning stations but I much prefer these chemical free Kleenex wipes! The phone list is a huge help for me! DIdn't know to put the lipstick on the tip of your finger! These are all great tips. This will come in handy next time I go shopping. Thanks for sharing. So glad to hear it! Thanks for stopping by! This is simple but brilliant. I definitely need to do this next time I'm shopping for makeup because I walk out of the store looking like a clown. Kleenex wet wipes are a brilliant thing to keep in your bag for makeup testing. Though I prefer not to test makeup right out of the container at the store unless there are testers available. I love when brands leave testers open for people to use. It makes it so much easier to tell whether it will work on your skin. I agree! I research makeup swatch videos and find bloggers with similar skin tones to get an idea of the shade for me and then only swatch the ones I plan to purchase. Some of the big stores that have testers available, but they are used by everyone and only offer alcohol to clean up—Kleenex wipes are free of harsh chemicals and antibacterial so I don’t have to worry about damaging my skin or catching germs from the used testers! Great ideas! We still but wet wipes on bulk long after all of our kids have been out of diapers because they are SO useful. That will be me! I love that Kleenex wipes don’t have the harsh chemicals that the wet wipe tubs usually do!